A casement window is an attractive option for any room in your home. A casement window is hinged at the side and cranks outward. This makes them a perfect choice for areas of them that need an easy-to-open window, such as above the kitchen sink or other hard to reach places. With many available options, a casement window is an architecturally adaptive and energy efficient alternative to other styles. Rather than lifting upward or downward, as single hung and double hung windows do, a casement window opens outward with a crank, lever, or handle, usually located in the middle of near the bottom of the window, and this handle also serves as a window lock. This crank is necessary to open the window outward. A casement window also features a crank, stay, or friction hinge to hold the open window in place in windy conditions. A casement window usually costs $200 to $500. Due to the large size of casement windows, installation costs for casement windows can be a bit more expensive at $75 to $250 for each casement window. Despite this slightly higher price, homeowners may want to keep in mind that the larger window size translates to an easier exit in case of fire or other emergencies in your home. A casement window's architectural versatility allows for a wider range of available options and of prices. A casement window with added features may cost $2000 or more. The classic crank-out style for a casement window is elegant and sturdy. A classic casement window's sash opens smoothly to offer maximum ventilation. Additionally, many standard casement window styles also include heavy frames and full perimeter weatherstripping. Available in many types and sizes, architectural casement windows deliver outstanding beauty without sacrificing or limiting performance. Radius top casement windows feature graceful curves atop each window. Similarly, french casement windows include two windows and two sashes that open outward to create a larger opening. Additionally, push out casement windows, reminiscent of old world style, are once again popular. This kind of casement window can be opened easily by turning the handle upward and giving the window a gentle push. 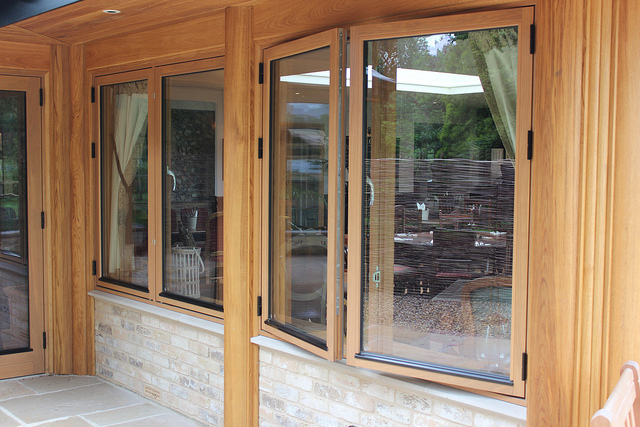 Compared to other operable windows, casement windows not only provide better draft resistance, but also let in more light. The U-factor (insulation value) for different casement windows will vary according to the manufacturer. On average, a casement window's U-factor is 0.17-0.18. Its the SGHC (solar heat gain coefficient) is usually between 0.20-0.21. A popular option, casement windows provide abundant light and more ventilation that many other window styles. With a tightly closing window sash that offers draft resistance, casement windows will also keep your home secure and snug.